Hello everyone, I am Theresa Genzling, for some of you who know my husband James, "Jimi" to all his friends, what I am about to say will be no surprise, so let me tell those who don't know him about him and why we could use a bit of help. Anyone who has ever meet Jimi will know that he will do anything to help a stranger, acquaintance or friend to the point it would interrupt his efforts in something else he was doing and he would stay at it till whoever it was need is satisfied or he has found someone who can satisfy it. No matter the need he has always given of himself to help others, especially if it involves a Veteran. Ever since I have known him, (since 1977), he has always been going and going, seams he was the prototype "energizer bunny". Like when we used to do Christmas for Our Troops, I would watch him run 20 hours a day setting up collections, picking them up, sorting until the early hours of the morning, grab a few cat naps, (including the cats), and then coffee up and get at it again. Four years ago when we were ground zero for a 52" flood and practically lost everything I watched him endlessly working to clean, disinfect and rebuild a place for me to be safe, dry and comfortable. Some, mostly 80% of what needed to be done is still unfinished, but, I am safe, dry and comfortable, mainly because he is here and still never quits, well, almost. The one thing that has never changed about him is the never ending love and caring he has for me, and his desire to keep me comfortable and happy. And I am. For the last several years he has built a business from the ground up doing gun shows with his custom work and a full line of parts, accessories and equipment, (along with bucket loads of help to our customers, weather they can pay or not). It has been a lot of fun and we make enough to keep it going and also to keep up with the constant "Honey Do" list he has here. We have never missed a show, until last week. Now that you have a bit of understanding of who I am married to you may understand why this is a bit embarrassing for him, he has always been the one to help, not ask for it. But I understand what has happened, and how it will effect the future, and we need it. Christmas day 1018 Jimi downloaded his "Blue Button" from his Veterans portal on My Healthy Vet for some labs and notes for our daughter Amanda. Visiting with her before Christmas she kept complaining about his weight loss and wanted some answers. She is a BSN-RN at Hendrik Hospital in Abilene Texas. He sent her the 33 page download and didn't think of it again for a few hours. When he did go back to close it out he scanned across it and got stuck on page 32. There were the doctors notes on a C-scan with contrast he had the day before we left to see Amanda. Under findings it stated, "2cm Mass, Pancreatic Cancer". 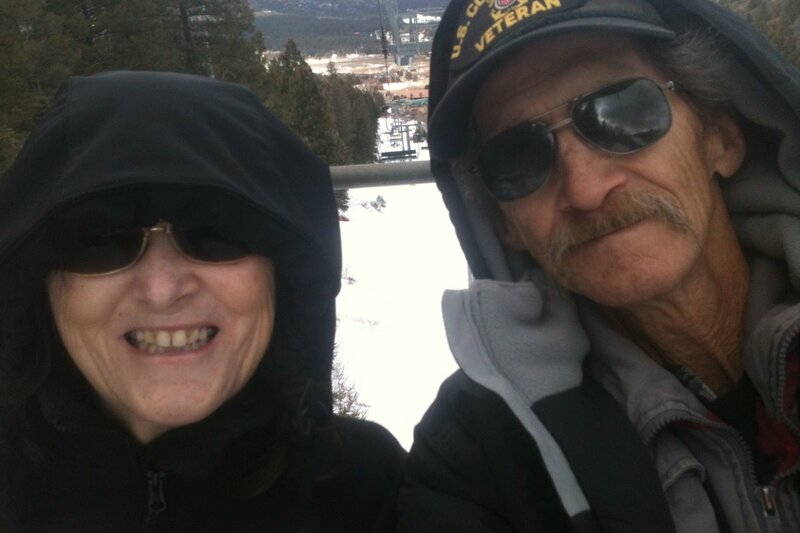 The day after Christmas he was on the phone to his GI doctor at the VA hospital in Albuquerque NM. I am proud to say that his VA is not the one you hear about on the news. He brags as to how he is treated with gold star service from all his doctors, nurses and techs, Best medical care there is in his words. And they proved it again. From January 3rd on it was as if he was the only patient his team had to concern with. Expedited appointments for tests, biopsies, planning and finally on March 1, comprehensive surgery in Tucson AZ. for a Whipple Procedure. If you aren't familiar with it, look it up, I was scared for him when I understood that they were going to remove part of his pancreas, stomach and part of his small intestine. It has left him with a stomach about the size of a tennis ball after what they removed was about the size of a nurff football, (what the doctors explained), and a feeding tube to supplement his diet and get his weight up before the Chemo. Of 26 lymph nodes, 17 showed cancer. The 25th we have our first planning appointment with the Oncologist about what is ahead. Jimi had maintained a steady weight of 150 to 160 pounds since I have known him. Last week he was down to 110 and today is up to 112.8. The doctor and a counselor seam to think his concern for me and the lack of money is stressing him some and making gaining weight more difficult. The one constant we have it God. God is definatly in this for the long haul, as he has been from the begining, we just have to remember that. The most difficult thing to keep in front of us during this is that God does have a plan, and is in control, we just have to remember that. That is the reason we ask for prayers, our faith is not shaken, is is just misplaced at times when the pain gets up so much that Jimi wont say a word, but I can read all of it on his face, and it hurts me. We have faith of getting over and thru this, I just get so tired sometimes constantly watching over him. My strenght and faith needs a boost several times a day, as does his. I am doing what I can to keep him up and cheerful, but missing the gun show weighs on him because we didn't have any deposits and have 3 days of travel and accommodations to take care of next Monday. And the same think weekly after that and we don't know what or where we will be doing chemo or the demands it will put on him and his little body. With the stress the surgery and recovery along with the weight loss he cant spend 8 to 10 hours working in the shop for customers and projects for the gun shows. He will work out there for a couple hours, come in, eat a bit, rest a while and then try to do it again. I hate seeing him so discouraged by not doing what he loves to do. He just dosent have the energy to get going and when he does he runs out after just a short time. But, being him, he tries to push it more than I think he should. He is restricted from lifting anything over 8#s and keeps talking about getting on the roof to fix it before the rains come and getting materials to fix some needed repairs he was working on before the surgery, some involving ladders and sheetrock. I almost have to chain him down to keep him from doing something stupid and tering up the surgery before it completely heals, (another 2 months they say for safety). Now that you have a basic understanding of what my husband was like, and how this has affected him mentally and physically, you might be able to see why I am asking for help. Several friends have suggested do this, Jimi is kind of torn by it, but he does agree that we cant make it without at least some help. What we are hoping is that we can gather at least enough to help cover the travel, food and accommodations over the next however long we will be at this. We would also ask that you please keep Jimi in your prayers, if you do have a relationship with our Savior, and talk with him. If you don't, and would like to meet him, we can help with that as well. Thank you all in advance for listening, I will answer any questions and also endeavor to keep you all informed as to progress if you like. Hello everyone, first off, we must apologize for no updates or thank you notes to those who have helped us out. Every dollar has gone to covering the expenses of our weekly 2 and 3-day trips to Chemo and other Dr. appointments. And it has helped greatly. We pray that for every dollar that has been given that the Father God would return it a hundred-fold to those who sacrificed to send it. There are so many other needs that fall in people’s lives, some of an urgent nature, some as complete surprises, but needs no less. For those to take of their own and give to those they know not is a special kind of blessing to us, and we pray it is to them as well. Each time I watch my Bride Theresa sit back and relax after a chemo or sit with me and enjoy something to eat so far from home without worry I thank our Lord for those who helped us travel and get the treatment I need without fear of being stranded or hungry. Again, thank you all so much. Now for what all has gone on. We started the chemo with much trepidation and fear. When I first heard that I was going to have to fight this "monster" with chemicals that kill indiscriminately, and do it willingly, I was inundated from every direction with every horror story of how so and so suffered thru it. The positive stories were few compared to the horror stories, however, the positive stories and support came from so many friends and acquaintances that actually and sincerely cared about us that they outweighed the horror one by shear compassion. To show how positive, supportive conversation can help, I feel better now than when I did before it started. I have not been knocked down and bed ridden as so many said I would be after the first couple treatments. We have finished the first bank of treatments and have only suffered some tiredness and occasional slow downs and hair loss. I become irritable sometimes, probably more due to aches and pains still from the surgery or stomach trouble that seems to linger no matter what, but, I am just as active and productive as I was before we ever found out that this was going to be a part of our life. And I love it. People continually question if I really do have cancer and going thru chemo because I don't look and act like others suffering from it. I politely tell them that I have a support system that covers the nation and is based on Prayers, (both ways, to and from), and positive support. Fatigue sets in at unexpected times, sometimes when we are on the road to or from appointments. Its good that Theresa can drive and give me a break. I am constantly having trouble with my stomach, not knowing if it is to full or empty, I just have to eat a little to find out. I still have no nerve feeling in my belly area or stomach. That is what gives me problems, not knowing and not being able to feel hungry or full. My weight is still below 120 by a few pounds, but occasionally creeps up to it, just want to get some back on and keep it. This last Tuesday we went in to start the second round of the chemo, and got it postponed. Seems my hemoglobin, (red blood cell count), was just above 9, getting dangerously close to having to have a transfusion to build up the blood again, or start a med to try to make my body produce more. Depending on how my labs look Monday we may start round 2, or something else, we will endever to keep everyone informed. It seems that my spirits stay up as my body slows down, but I keep trying to keep the productivity up, but I discovered today that I am requiring more sit downs than yesterday and things are starting to take a bit more time. We will see. The trips are running well, as well as can be expected, no matter what it is a very long drive there and back. We have had to extend a day a couple of times due to being tired after treatment and just not up to making a 5 hour drive with stops. That upsets the routine because we sometimes have to dip into reserves for expenses but it works out in the end. We just have to be frugal. At the current speed looks like at least another 5 months of chemo. We are on the docket for another PET Scan late July to see what is happening. So for now we again thank everyone for their help and prayers. We still have many many trips to make and many nights away from home. Again, thank you to all who have contributed, and those that will, we still need some help.